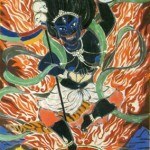 The Dakini is the mysterious Sky Going Goddess of Tibetan Buddhism. 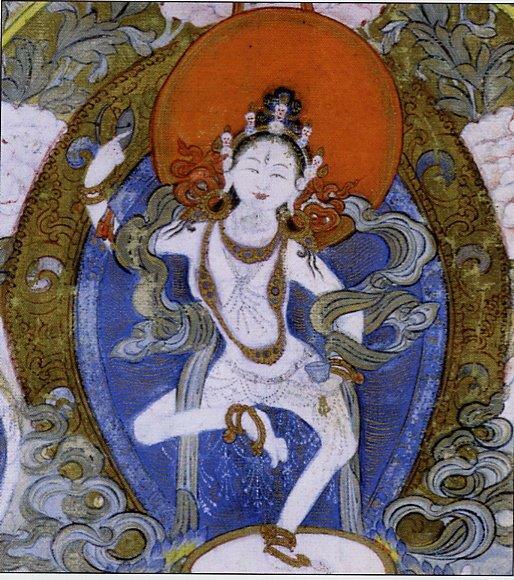 In peaceful and wrathful emanations, she heals by transforming the poisons of aggression, greed, addiction, jealousy, self hate and delusion into the medicines of clarity, generosity, warm presence, spontaneous accomplishment and spacious accommodating presence. 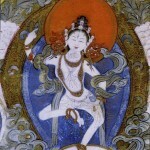 To use Rita Gross’ phrase, the Dakini is a powerful myth model for women. She is embodied, wild, compassionate, powerful and magical. When I think about the times we’re living in, what we must meet, and ways to transform the poisons in ourselves and the culture, I always return to the Dakinis. This is an invitation to enter this Mandala (womb) each Full Moon on behalf of our own healing and that of all beings. It is a time of Refuge. In this Mandala practice for Western non-Buddhist women, transmitted by Vicki Noble, we will call to the Dakinis, through invocations, chanting, and visualization and then we will take refuge in their presence. 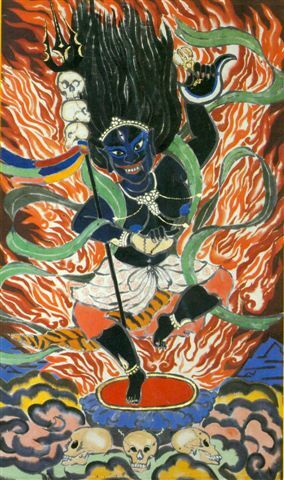 We will also chant the mantras of the Black Dakini, Throma, who with fierce compassion dissolves our most deeply entrenched patterns of suffering and thus ways we cause suffering. If you have received transmission of the practice from me or Vicki then simply register and come to Earth Spirit Council House on any of the dates below. We will begin with a brief sharing, the soul retrieval Dakini Mandala and end with the Throma mantras accompanied by drumming and then a silent meditation from 30-45 minutes. Bring something for the altar that you will take home with you. 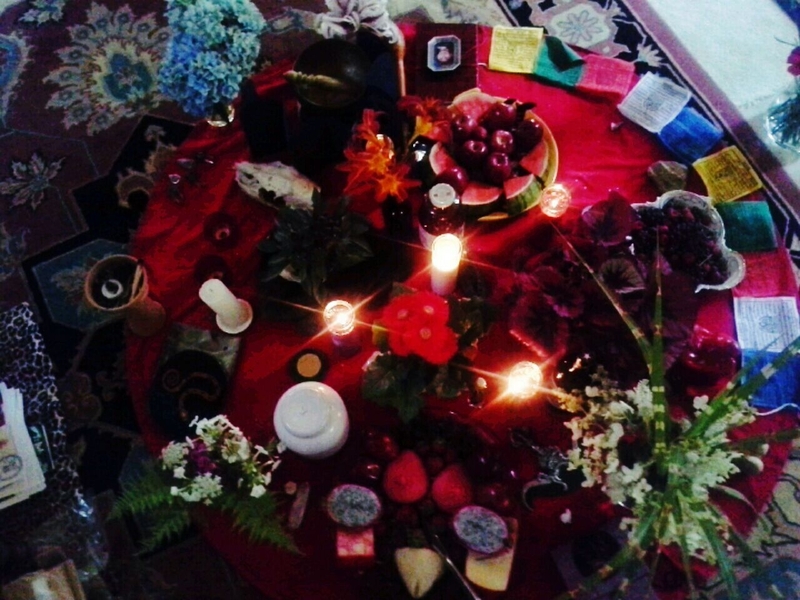 Also, the Dakinis and Spirits love altar offerings of flowers, stones, shells, tobacco, etc. etc. If you’d like to speak to someone who has been doing this practice to hear their experience over time, let me know. Cost for two hour transmission teaching and practice book is $50. Any woman who has received this practice is welcome, and if you have not, yet seek to sit among women in Holy space absorbing the practice, you are invited as well. I ask a donation of $20 per gathering, more if you can, to cover the costs, please register ahead of time. No one is turned away for financial reasons. For information, call me at 860-693-9540 or send an email using the contact button above. Introduction: Two hours – time TBA depending on need. Dates: 7 to 9 p.m.